The 12 m radio telescope APEX in Chile has been outfitted with special equipment including broad bandwidth recorders and a stable hydrogen maser clock for performing joint interferometric observations with other telescopes at wavelengths as short as 1.3 mm and the goal to obtain the ultimate picture of the black hole shadow. 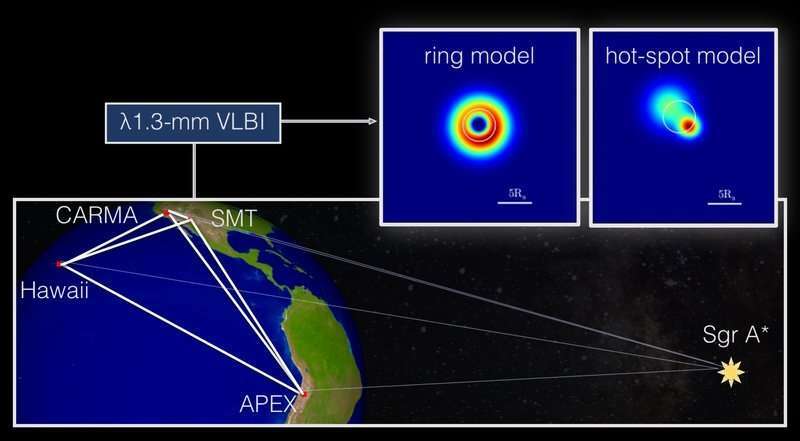 The addition of APEX to the so-called Event Horizon Telescope (EHT), which until recently consisted of antennas only in the northern hemisphere, reveals new and unprecedented details in the structure of Sgr A* at the centre of the Milky Way. The increased angular resolution provided by the APEX telescope now reveals details in the asymmetric and not point-like source structure, which are as small as 36 million km. This corresponds to dimensions that are only 3 times larger than the hypothetical size of the black hole (3 Schwarzschild This corresponds to dimensions that are only 3 times larger than the hypothetical size of the black hole (3 Schwarzschild radii). Astronomers are hunting for the ultimate proof of Einstein's theory of general relativity, which is to obtain a direct image of the shadow of a black hole. This is possible by combining radio telescopes spread over the globe using a technique which is called Very Long Baseline Interferometry (VLBI). The participating telescopes are located at high altitudes to minimize the disturbance from the atmosphere and on remote sites with clear skies, allowing to observe the compact radio source Sagittarius A* (Sgr A*) at the centre of the Milky Way. The research team observed Sgr A* in 2013 using VLBI telescopes at four sites. The telescopes include the APEX telescope in Chile, the CARMA array in California, the JCMT and the phased SMA in Hawaii, and the SMT telescope in Arizona. Sgr A* was detected with all stations and the longest baseline length reached up to almost 10,000 kilometers, indicating an ultra-compact and asymmetric (not point-like) source structure. "The participation of the APEX telescope almost doubles the length of the longest baselines in comparison to earlier observations and leads to a spectacular resolution of 3 Schwarzschild radii only", says Ru-Sen Lu from the Max Planck Institute for Radio Astronomy (MPIfR) in Bonn, Germany, the lead author of the publication. "It reveals details in the central radio source which are smaller than the expected size of the accretion disk", adds Thomas Krichbaum, initiator of the mm-VLBI observations with APEX. The location of APEX in the southern hemisphere considerably improves the image quality for a source as far south in the sky as Sagittarius A* (−29 degrees declination). APEX has paved the way towards the inclusion of the large and extremely sensitive ALMA telescope into the EHT observations, which are now being performed once a year. "We have worked hard at an altitude of more than 5000 meters to install the equipment to make the APEX telescope ready for VLBI observations at 1.3 mm wavelength", says Alan Roy, also from MPIfR who leads the VLBI team at APEX. "We are proud of the good performance of APEX in this experiment." The team employed a model-fitting procedure to investigate the event-horizon-scale-structure of Sgr A*. "We started to figure out what the horizon-scale structure may look like, rather than just draw generic conclusions from the visibilities that we sampled. It is very encouraging to see that the fitting of a ring-like structure agrees very well with the data, though we cannot exclude other models, e.g., a composition of bright spots. ", adds Ru-Sen Lu. Future observations with more telescopes added to the EHT will sort out residual ambiguities in the imaging. The black hole at the center of the our galaxy is embedded in a dense interstellar medium, which may affect the propagation of electromagnetic waves along the line of sight. "However, the interstellar scintillation, which in principle may lead to image distortions, is not a strongly dominating effect at 1.3 mm wavelength ", says Dimitrios Psaltis from the University of Arizona, who is the EHT project scientist. "The results are an important step to ongoing development of the Event Horizon Telescope", says Sheperd Doeleman from the Harvard-Smithsonian Center for Astrophysics and director of the EHT project. "The analysis of new observations, which since 2017 also include ALMA, will bring us another step closer to imaging the black hole in the centre of our galaxy."